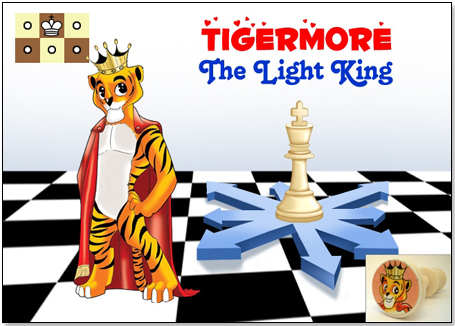 Developed by math and science educators and engineers from MIT and other top universities* in collaboration with Jennifer Shahade – two-time United States Chess Champion and Women's Grand Master, the new game Yamie Chess(R) meets kids 5 to 14 years at their own level, drawing them into an imaginary conflict between King Tigermore and the Mind Angels(R) and the King Vigdor and the Chromemunchers(TM) that is enacted on a chess board. Each chess piece is translated into an engaging, magical character that kids read about in an accompanying 260-page comic-coloring-activity book and can watch in an award-winning animated series while learning STEM (science, technology, engineering and mathematics) skills and classic chess moves. 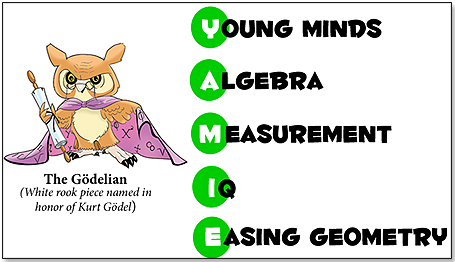 ("Yamie" stands for Young minds, Algebra, Measurement, IQ, Easing geometry.) The company also provides K-3 and K-8 teachers' guides for the game. 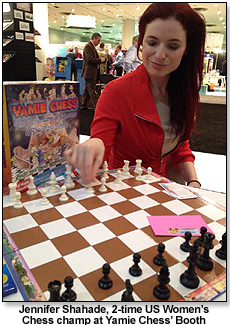 TDmonthly’s Retailer Reporters were impressed by Yamie Chess’s comprehensiveness when they encountered the game at Toy Fair 2014. "Yamie Chess was one of the most interesting items of the day," said Sallie Kashiwa, of Timbuk Toys "[It] will be great for home school families, educators and highly motivated parental mentors." Multiple peer-reviewed academic studies have demonstrated that playing chess can help improve kids' math, science and problem-solving skills, and raises their grades in both math and reading. Many US children, however, suffer from math and science phobias and are convinced that they cannot excel in these areas. Turning STEM skills into a story and transforming chess from an intimidating game for "geniuses" into an imaginative battle between good and evil replaces pressure with play. "I started paying chess when I was really little, and I think that anything that increases kids' interest in chess is a good thing," said Jennifer, who is the daughter of a former chess champ and was named the strongest US-born woman's chess player of all time by Smithsonian Magazine in 2003. Yamie Chess pits the status quo (King Tigermore's white pieces) against the disrupting force (King Vigdor's black pieces), much as classic American Western movies identified the good guys and bad guys by hat color. An illustration of each character appears on the bottom of the corresponding classic chess piece, which is sized for children's hands. The board is USA 20" x 20" tournament-sized analysis classic chess set with 2.25" squares. The educational Yamie Chess® K-8 math comic activity and coloring book tells the story of Kimi, an 8-year-old American boy chess genius from New York as he considers different chess strategies (with algebraic notation) to help King Tigermore and the Mind Angels defeat King Vigdor and the Chromemunchers on the mind-planet of Snowmelt in The Mind Kingdom™ -- a magical place that Kimi reaches while under anesthesia for surgery after a skating accident. The comic is divided into three sections for the Opening, Middle Game and End Games of chess. It teaches kids how the pieces move, algebraic chess notation and geometric chess strategy. The first chess game that unfolds through the story is based on a 19th Century European Grandmaster level game which pitted Grand Master Johannes Zukertort against Grand Master Adolf Anderssen. 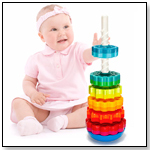 Activities are age-appropriate and increase in difficulty as the child moves through the story. All Yamie Chess® sets are made at a manufacturing facility in Battle Creek, Michigan, using American manufacturing and one hundred percent U.S. labor. More than 98% of the materials that constitute the scholastic math product series are sourced from within the United States. 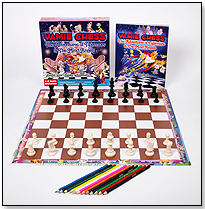 Yamie Chess ensured that their story and game had real educational value by having it reviewed by professional mathematicians, engineers and chess players. The game was heartily endorsed by Harvard mathematician Prof. Christian Hermann Hesse, MIT math professor Dr. Michael Ching, and University of Chicago math professor Dr. Ashley Ahlin, among others. 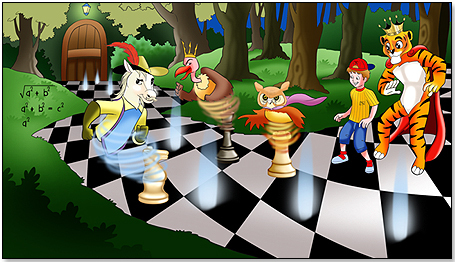 "Yamie Chess is the best product I’ve seen for children to learn chess via an engaging fantasy storyline," said Dr. Ahlin, whose 7- and 9-year-olds quickly became fans of the story and the game. Warner Bros. Pictures' Harry Potter chess consultant, U.S. International Master Jeremy Silman, summed up the general sentiment by saying, "When a child learns how to play chess, adds a lot to his or her science education, and has a wonderful time walking through a rich fantasy world, you can’t go wrong!" To order or learn more about Yamie Chess, go to www.yamiechess.com. 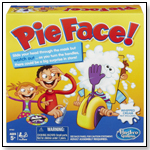 The game will be available for purchase for an MSRP of $29.95 on April 4, 2014. Retailers can place wholesale orders here: sales@yamiechess.com. Yamie Chess is a Harvard/MIT math PhD-backed STEM learning aid based on classic chess. Supports math education for 12 year olds in the K-8 educational grades. The math learning aid has been designed by MIT, Caltech, Stanford, Columbia, Vanderbilt and University of Arizona math educators and engineers in collaboration with 2-time United States chess champion Jennifer Shahade. Made in America.